"This was due to a vertical break of a 1912 pipe," confirmed PWB Public Information Officer Jaymee Cuti to THE BEE. "That's the most straightforward [type] to repair, in most cases." 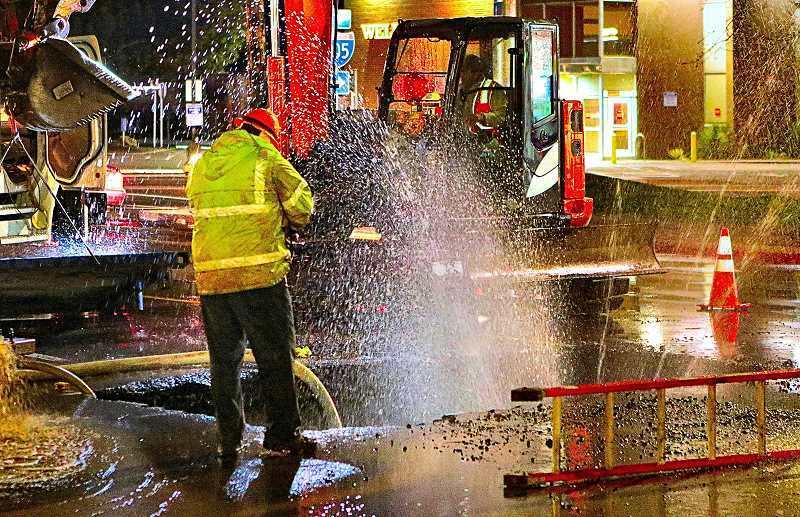 On the other hand, lateral failures, Cuti explained – such as the one on the same block two years ago – are more difficult to repair, because they require a larger excavation, complete removal of the old pipe, and installing a new pipe, before restoring the roadway. "We cut out and replaced 50 feet of pipe during the 2016 break," she pointed out. For a vertical break, crews apply a "repair clamp" around the break to make repairs, rather than having to replace the pipe. The next morning, most motorists driving over repair site weren't aware of the work done overnight; the patch was actually smoother than a great deal of the regular pavement on this State Highway.